I spent a lot of time in my late teens and twenties waiting for my financial life to improve. Buried in debt and not making a lot of money, I’d visualize how much better off I’d be if I could just hold out until my next paycheque, or until I got my next raise. I’d picture paying off one of my credit cards once I got my tax refund. I made the classic mistake of believing the edge of the rut was the horizon. Today I still daydream about a brighter financial future, but now instead of wondering about a life beyond living paycheque-to-paycheque, I’m using a well-thought-out financial plan to plot out our financial goals. I’m saving and spending with a purpose. But I’m still impatient. The car-loan that we took out when we bought a new Hyundai Sante Fe in 2012 won’t be paid off for another nine months. The line of credit that we took out to pay for our basement renovation last year won’t be paid off until early 2017. That means $35,000 going toward debt repayment next year instead of maxing out my RRSP, our TFSAs, the kids’ RESPs, or saving for some other future goal. Don’t get me wrong, I’m still saving, but I’m waiting for the day these loans are behind me so that I can move on to more exciting wealth building strategies. 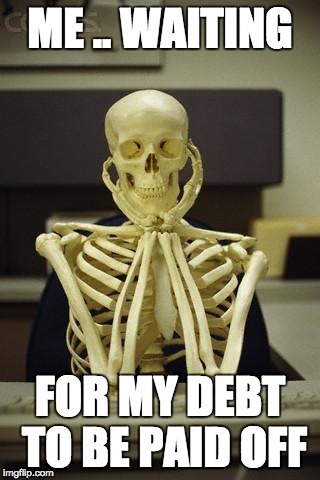 The waiting is hard, and not just waiting for debt to be repaid. Even saving $200 or $300 per paycheque can feel like a slow march toward millionaire status. I curb my impatience by tracking my net worth and making sure that the needle is still moving forward. My financial plan also includes projections years in the future – to a time when I can shift those line of credit and car payments into meaningful savings. “Most everyone wants to have better finances. But at the same time, most recognize the need to develop a strategy to make it happen. If you have largely abandoned any practical strategy to improve your finances, and mostly fantasize about how it will feel when things are better, it’s a good indication you’re financially unstable. We make financial improvements one inch at a time and stick with our plans to help avoid impetuous decisions and mistakes. We measure our progress regularly and adjust course if needed. We allow ourselves to dream in a practical way as it relates to our future goals. It’ll still feel like forever before our debts will be paid off and we can focus on saving again. But this time I see the horizon, and not the edge of the rut. Time is all relative in these situations. While it might take a long time to pay off your debts, how much longer will it take if you don’t start paying them off today? In this case the journey is not the most important part, it is the End Point! It’s important to keep moving towards measurable goals in all stages of life. Waiting though is part of life and most of us are not good at it. Try this then. We were thrown a wrench into our plans for financial freedom when my husband was diagnosed with a brain tumour and became disabled. He isn’t going back to work. So for us our wants which we planned on are not going to be there but our needs are. So what I am trying to say it start your plan early and stick to it. You never know what life will throw you. I think that’s the scary part for all us planners Susan. We’re worried that our best laid plans and dreams for the future will be completely derailed by a disastrous life event like the one you described with your husband. I’ve already been through Type 1 Diabetes when I was 24. I’m just really hoping that I’ll be able to avoid anything else really serious in the near future. Unfortunately, that is definitely not guaranteed. For me, I found that focusing on the process was more important than thinking about the outcome. Once I was convinced that I had my investing strategy right and was saving a significant portion of my take home pay, it was just a matter of letter the system work. At a certain point I passed the threshold where I was confident that I didn’t need to work any more. At the time, I was enjoying my career for its own sake. When things changed in my work environment and I didn’t want to be there any more, it made it quite easy move on and end traditional employment. Waiting wasn’t particularly hard for me, but it was key. I’m not so good at waiting myself. Maybe that’s why I’ve always been better at rising my income than saving and paying debts! I’m now more and more facing this flaw as the RV comes fast and we need to downsize everything. What ever happened to waiting until you saved enough money to develop the basement or buy the new vehicle? Live below your means and avoid stupid debt. A new vehicle is a stupid debt, unless you can write off the costs through a business. Even then, buy a 1 year old unit from a lease company. Hi James, I think what happened – at least for me – is that interest rates are so low that there’s a good argument to finance the purchase now and pay it back over the time it would have taken you to save up and pay for it in cash. My basement renovation, for example, will cost me a few hundred dollars in interest as I pay off the loan over 2 years, but the work is done now and we can enjoy the space. Maybe in two years I can’t find a contractor because they are too busy, or the cost of labour and materials rises at a higher rate than the interest on my line of credit would have been. Regardless of my decision, I’d still be waiting today. Waiting to save up enough to pay for the renovation in cash, then completing the renovation, before moving on to my next savings goal.